Your roof is one of the most important aspects of any home or building you own. When your roof leaks or needs repair, you can suffer significant damage to other aspects of the structure without immediate repair. Many home and business owners focus on the internal or appearance aspects of maintaining a structure. However, a roof in dire need of repair can eventually lead to problems on the inside of a building, as well as permanent structural damage. When it is time to have work done on your roof, call King Group, CES. Our technicians are in the top of their field and offer quality, reliable service you can count on. You should never trust a company that cuts corners on your roof. King Group, CES has provided quality reliable service to thousands of customers. 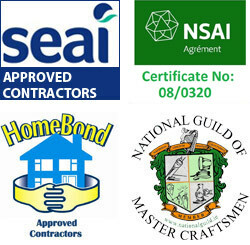 With our proven track record here in Ireland, you can rest assured your project will be completed correctly and on time. If you have an emergency roofing problem, King Group, CES is just a phone call away. Whether you have a tree on your home or a leak you have let go too far, they can fix it right away. King Group, CES has technicians on standby night or day to fix your emergency roofing problems. You can expect their technicians to give you a quote upfront, so you can decide what you want to do. King Group, CES always takes careful consideration to give you an accurate description of what the problem is, and how intensive your repair will be. The average roof lasts 15-20 years before it needs to be replaced. When it’s time to look in to replacing your roof, King Group, CES is the company to call. They offer the latest types of styles for your new roof and every replacement comes with a 20 year warranty. While replacing a roof can be a rather large investment in your property, it can also quickly raise the value of your home. Contact King Group, CES immediately if you think your roof may need to be replaced. They will complete a full inspection and tell you if replacement or repair is best. For further information on Roofing Services call King Group CES on 045 838376 or click here to complete our free online enquiry form.